Here is the super cute something I promised you. I wanted to make it into a video, but I have developed a cough and would be coughing about every 3 words. So I figured a picture was my next best option. 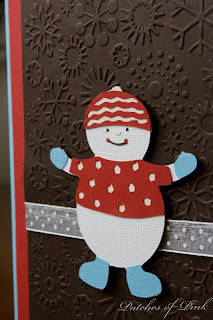 Therefore, in honor of all the snow we got these past couple of days, I thought I would make a snowman card using my Snow Friends Cricut cartridge. 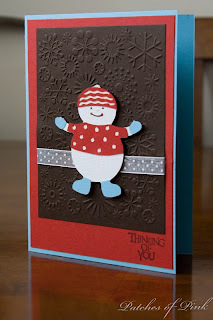 I also used my Cuttlebug to emboss the snowflakes on the brown cardstock. Also, I know you can't see it, but there is cream colored cardstock under the shirt and hat layer. What do you think? Comments? I thought about sending this card to my in-laws who are currently in Florida!